The final theme for Project Sewn is Signature Style, how fun. Add in Coletterie Wardrobe Architect to give us the opportunity to really think about what shapes, styles and colors we wear and what a great combination. If I could, I would dress up everyday. Think of the late 1950’s to early 60’s, before everyday casual came into prominence. I don’t collect vintage, but I love vintage influences. I’d be happy to see matchy-matchy shoes and bags make a comeback, especially ladylike handbags. 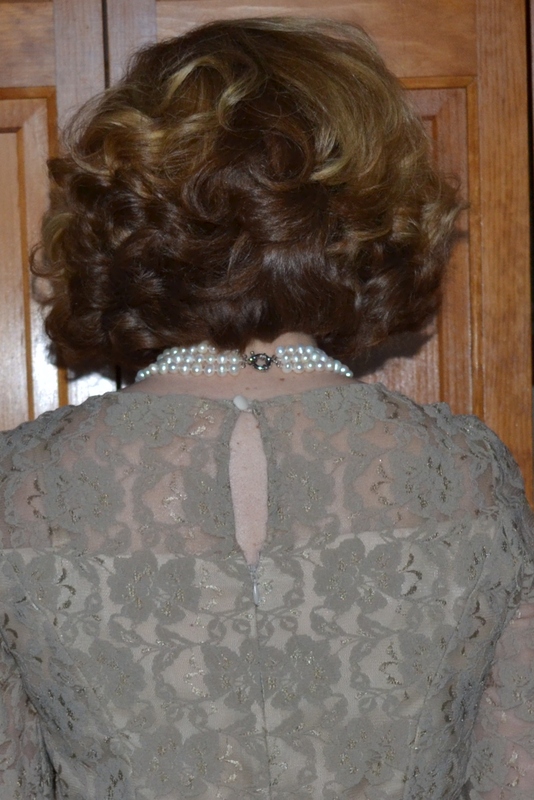 Give me lace, pearls, and bows, girly for grownups. My pattern for this, Vogue 8413, view D, minus the collar. 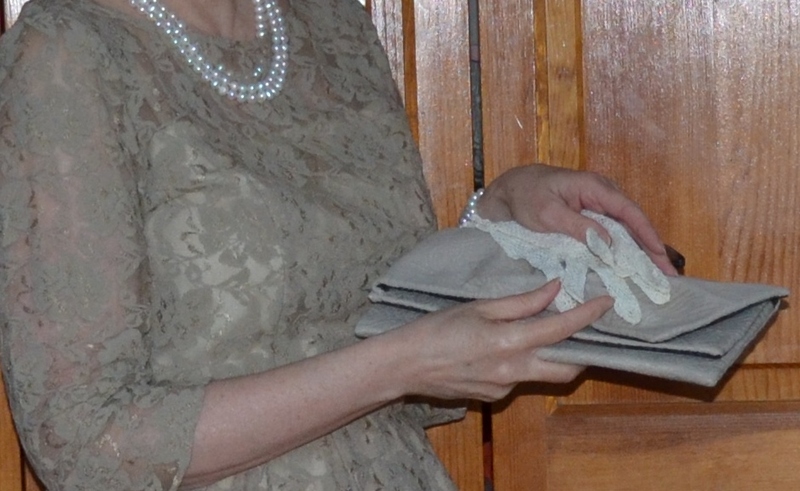 The lace was a sale piece I found at Haberman Fabrics with an ivory lining. Since it was the second time with the same pattern, I already had it marked for fit. I did a muslin the first time and made my regular short person adjustments. Although I’ve been trying to wear more color lately, but I’m most comfortable in neutrals. I hate to admit how many pairs of shoes I have the same color as this dress. The lining is cut straight across the bodice in both front and back, but is very subtle. Instead of facings, I just turned and hand stitched the neckline and back opening above the zipper. The matchy-matchy clutch bag is made from some sample upholstery fabric from the sample room the Interior Design Department has at the college where I work. Once a year they clean it out and have a big give away. Would I wear white gloves in public? Probably not. I bought these at a very cute little shop in Covent Garden, London in the 80’s, so I guess they’re vintage now. Oh this is gorgeous! I think you are right about us having the same taste in clothes. I wear matching shoes and handbags all the time. And I love lace and bows! This dress is beautiful and you look great! Thanks. So glad there are other matchy-matchy fans out there. Fabulous dress! You look very glamourous! This fabulous fabric is the best with such simple pattern. Thanks, if only I had more reasons to wear it. I recognise it… I would like to make and wear so many dresses … need more occations. 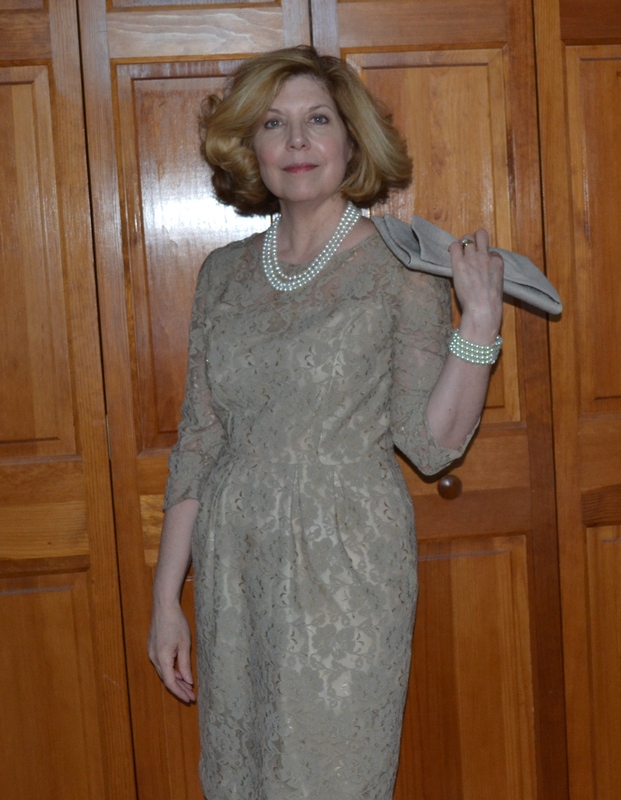 As you said – 50’s and 60’s were perfect for such dresses. Great Facebook page, love the style. Thanks. it’s been fun to keep up with Project Sewn. You have my vote, it’s pefect! Oh, thank you that is so nice. This is the good link to my sewing blog, sorry! This is absolutely beautiful! Thank you for introducing me to Haberman Fabrics! You’re welcome. Hope you get to visit them sometime.